A client I hadn’t heard from in a while contacted me at the end of last year. He had a print ad pulling a very respectable three times ad cost and wondered if he could get it even higher. His objective went beyond merely trying to bump response since he was close to getting his product in a national retail chain, and he was looking for the tipping point to get there. But as bright an aura as his ad seemed to have, it also cast a dark shadow. The market clearly wanted the benefits his product offered. But for a large segment of them, it meant accepting a disadvantage they assumed went along with the benefits. I’m an eternal optimist but when he told me his ad was doing 3-to-1, I didn’t hold out high hopes for significant improvement given his media costs. So it was a relief to spot some low hanging fruit when I finally got my hands on the ad. As in, with all the benefits showered on you… but without any of the drawbacks. In these cases, with the dark shadow of some assumed disadvantage looming in the background, there’s no time to mess around and address it in the fine print. You’ve got to let the market know they get everything they want without the thing they clearly don’t want, and do so right away. I made only two changes to the control ad. 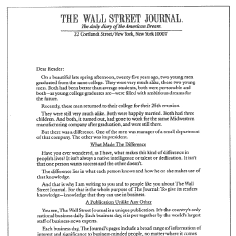 Here’s a lead generation ad, or a want ad if you will, from Merrill Lynch during their halcyon days in the early 1970s. 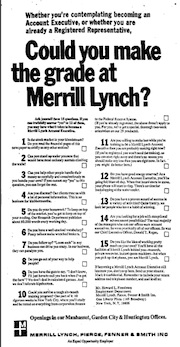 Before the era of the vampire squids and the CEOs who detonated century old companies with toxic derivatives, Merrill was a genteel place to work and boasted Ogilvy & Mather as its ad agency. Imagine the psychographics of the candidates a company could recruit in 2016 using print advertising with a detailed questionnaire like this one. Could you make the grade at Merrill Lynch?